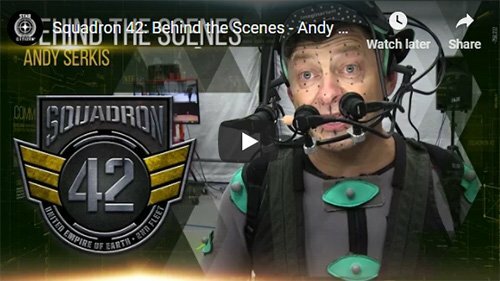 Squadron 42 - Gameplay, the Cast, Release Date, Trailers and More! HomeTransmissionsSquadron 42 – Gameplay, the Cast, Release Date, Trailers and More! Squadron 42 – Gameplay, Cast, Release Date, Trailers and More! Squadron 42 (Sq 42) is a single-player game that takes place in the Star Citizen universe and occurs prior to your entry into the persistent Star Citizen universe. It is meant as the spiritual successor to Wing Commander. The game is being developed at Foundry 42, the Manchester, England studio of Cloud Imperium Games. 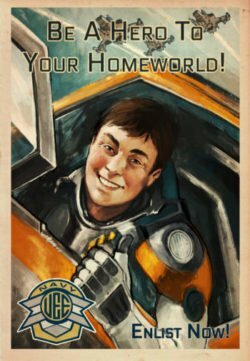 The single-player campaign will introduce the player to the Star Citizen universe, but playing the solo game is not a prerequisite for playing the MMO. For players that want to skip Squadron 42 , they can begin the MMO with no negative effects. What Will Be Included in the Game? Squadron 42 is set in the year 2945, at a time when the United Earth Empire (UEE) is fighting to keep Humanity alive. Massive capital ships like the Idris and Bengal Carrier protect the human systems from aliens like the Vanduul as well as raiders, bandits, and outlaws from inside its own borders. In the first episode, you enlist in the UEE Navy as a rookie pilot in the war against the Vanduul. As you battle the Vanduul, you eventually get accepted into the legendary 42nd Squadron aka Squadron 42, a volunteer unit assigned to the Bengal Carrier UEES Paul Steed. Made up of a ragtag bunch of misfit pilots that seek out battle with the enemy when others run, they are constantly in the hottest battles and often outnumbered. They’re famous for their ability to come out on top regardless of the odds. On the Paul Steed, you’ll serve alongside a living, breathing crew, each with personalities and storylines of their own. A full conversation and reputation system allows you to define your character and create a personalized experience all your own. The Squadron is part of the UEE’s 2nd Fleet and has taken part in many of history’s most pivotal battles. One of the times that the Squadron 42 turned the tides of a battle was during the Second Tevarin War at the Battle of Centauri in 2610. Squadron 42 is set to be released in three episodes. Episode 2 is slated to be called Behind Enemy Lines and episode 3 has not been named yet. Each one will be playable as a standalone game unto itself but will be a continuation of the story. The release date is set to be sometime before the release of Star Citizen. The latest news from CIG is the game won’t be out until at least early 2018. The first episode is expected to be 20+ hours of gameplay with 28 chapters and around 70 individual missions. These missions will involve all forms of ships, from fighters to dreadnoughts and involve dogfighting in both space and in the atmosphere of planets. Flying won’t be the only type of gameplay however, there will be FPS gameplay involving both stealth and brute force missions. These will take place on everything from mile-long capital ships to full city-sized space stations and everything in between. The weapons include futuristic pistols, submachine guns, assault rifles and even heavier weapons like railguns. One of the most anticipated features of the game is its story. Using a cast of A-list actors, there are more than 340 speaking roles enhanced with state of the art facial scanning and motion capture. The level of facial scanning allows for an accurate representation of nuanced facial features which brings the acting to a level never before seen in a video game. Overall, the story covers more than 20 hours of performance capture and 1255 pages of dialogue. Groundbreaking AI and environment technology are set to put the game far past its competitors. The subsumption AI is fully systemic, follows 24-hr schedules, has more than 1000 subroutines and seamlessly goes about taking care of secondary objectives. This brings the capital ship that you call home in Squadron 42 alive. The AI won’t only be talking to you, they’ll also be fighting with you. The AI will adapt to your strategies and learn to counter your attacks making each victory feel meaningful. As you complete the single-player campaign, you enter the persistent Star Citizen universe. Depending on how you did in your playthrough, you may have earned some cash and even citizenship. It’s also believed that you will start with an enhanced reputation with the UEE military and may have access to military ships. 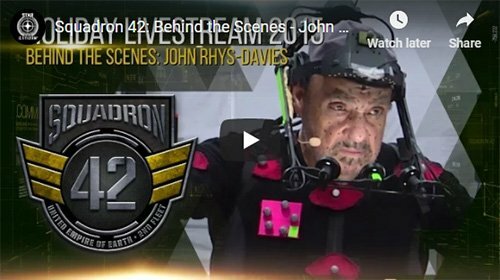 Featuring actors like Mark Hamill, Gary Oldman, and Gillian Anderson, Mark Strong, Liam Cunningham, Ben Mendelsohn, John Rhys Davies, Andy Serkis, to name a few, Squadron 42’s cast reads like a full-blown Hollywood movie. Gary Oldman plays Admiral Ernst Bishop in Squadron 42, a brilliant military tactician who is single-handedly outmaneuvering the Vanduul. Compared to Alexander the Great, Hannibal and Patton, Ernst Bishop is a lifelong soldier with a history of pulling off amazing victories. He got that reputation by being willing to accept risks that others won’t. By looking at a battleship as just a weapons system, rather than a ship with 500 people on board, he uses each asset on the battlefield without being hindered by worrying about the potential loss of life that his orders may bring. This has always been his secret to continue winning. 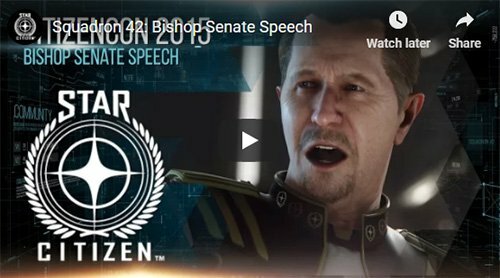 This trailer from CitizenCon is the first time we see Admiral Bishop in action as he addresses the Senate in Squadron 42. Mark Hamill plays Steve Colton, a legend in the UEE Navy. Old Man has flown every type of ship out there, taken part in every kind of mission and seen nearly everything there is to see. This makes him an amazing teacher to new pilots. His teaching style is harsh, but his results can’t be argued with. Steven Colton rubbed enough people the wrong way to effectively halt what could have been an amazing career. Through it all, he firmly believes that the UEE Navy is right, and he’ll do just about anything to forward its cause. The first video to feature Lt Cdr Colton was this Squadron 42 teaser from the Anniversary Livestream back in 2015. In this clip, “Old Man” is seen training new recruits in his Gladius fighter. Gillian Anderson plays Captain Rachel Maclaren, the daughter of Admiral Bishop. John Rhys-Davies (who also played in Wing Commander 3 and 4) plays Randall Graves, a pilot who served with the Old Man in the 118th Squadron. By the time we meet him, he’s been hired as head of security on a space station. Andy Serkis (best known for playing Gollum in the Lord of the Rings Trilogy) brings his ability to play non-human characters to the game by playing Thul’Óqquray, the main antagonist. Other actors playing roles within the game are Liam Cunningham as Captain Noah White of the UEES Stanton, Patrice Maiambana as Óqquray the Vanduul clan chieftain, Rhona Mitra as Executive Officer Kelly of the UEES Stanton, Jack Huston as UEE pilot Cal Mason, and Sandi Gardiner as Nayara “Pusher” Fell. The full cast can be seen on IMDb. The release date for Squadron 42 has been pushed back several times already. CIG will now be sending updates out on the progress that the game is making every month. There is no current projected release date at this time. This is the full version of CIG’s holiday Squadron 42 update video. They did a full 2 hour and 12 minute Around the Verse special with tours, interviews, and the Squadron 42 vertical slice. 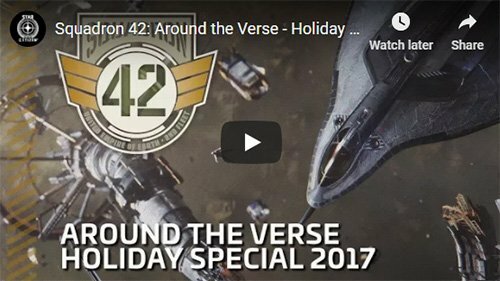 The Squadron 42 vertical slice is an hour and 7 minutes of gameplay from the holiday Around the Verse special. This was the first gameplay footage that CIG has released and it looks great! There are currently two ways to purchase the game. The first place you can purchase the game is the Squadron 42 Stand Alone Pledge for $45, but we don’t recommend purchasing it this way. It’s much better to purchase one of the Star Citizen Starter Packages with Squadron 42 for $60. Once it’s completed it will be available for download from the Robert’s Space Industries website. You can determine which package will be best for you by reading our Star Citizen New Player Guide.